My new ice cream maker arrived just in time for a gloriously hot summer. I started with a classic – vanilla ice cream made with a whole vanilla bean. It was a hard act to follow but I was just getting started. I just had to reproduce pro-baker Abigale Dodge’s Roasted Strawberry Ice Cream that I’d sampled during her cooking class at Stonewall Kitchens in Maine. Roasting the fruit is a nice technique to intensify the berry flavor. I honored the Northwest’s ripe blueberries with a blueberry cheesecake ice cream. Fragrant, wild blackberries along our trails drove me to try Food52’s top-rated recipe for blackberry ice cream, made with a can of sweetened condensed milk of all things (it lived up to the ratings). Overwhelmed with boxes of ripe-to-dripping peaches, I came up with the following very peachy peach sherbet. Less rich than ice cream but not as austere as sorbet, sherbet includes a little dairy richness – in this case a few tablespoons of cream. Peaches for Health: Peaches are a source of key nutrients, including vitamins C, A, K, the mineral potassium and dietary fiber. The pigments that give peaches their color are powerful antioxidants that help prevent diseases such as cancer and cardiovascular disease and protect eye health. One of the carotenoids that give peaches yellow-orange colors is beta carotene which is converted by the body to vitamin A. Anthocyanin pigments in the flavonoid family of polyphenol phytochemicals give the peach skin reddish color. (Reference 6). Picking the Perfect Peach: Have you ever seen the sugar content of peaches posted at a market? That tells you they care about delivering top-quality, tree-ripened fruit. The best tasting peaches ripen on the tree until the sugar content is optimal, as measured by a refractometer, then they are carefully picked and transported. After picking, peaches will soften and become more aromatic but will not get sweeter. Mealy peaches? It’s likely they were picked and chilled before they were ripe. Curious about frozen dessert nomenclature, I discovered that “sherbet” means different things around the world. In Canada, ask for sherbet and you may get sorbet or water ice. Sherbet in Britain and Australia describes a fizzy drink. The word evolved from an Arab word sharbat that described a sweetened fruit drink enjoyed in medieval times (References 1-3). In the U.S.A. the Food and Drug Administration legally defines the composition of commercially produced sherbet, ice cream and water ices. Sherbet must contain between 1% and 2% milkfat (References 4,5). Does it matter? You can break the rules when you churn your own. Fall is almost here. I have no regrets – I’ve preserved the sweet taste of summer in my freezer. Vodka helps to keep the sherbet soft and easier to scoop because alcohol freezes at a lower temperature than water – it doesn’t impart flavor. Similarly, a little corn syrup keeps the sherbet from being too icy. 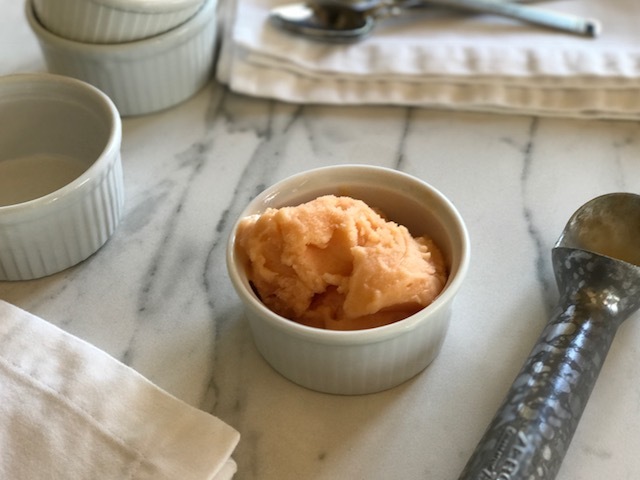 Despite these two ingredients, home freezers aren’t as cold as commercial ones so you’ll be better able to scoop a homemade frozen dessert if you let it soften at room temperature for a few minutes before diving in with your scoop. 2. In a food processor, combine peaches, cream, vodka and lemon juice. Whirl until smooth, stopping to scrape down container once or twice. 3. Transfer to a large bowl. Whisk in chilled syrup. Cover and refrigerate until well chilled. 4. Process in an ice cream maker according to manufacturer’s directions. *To peel peaches, bring a large pot of water to a boil. Carefully place peaches in water and simmer 1 minute. Remove with tongs or a slotted spoon. Cool. Slip off skins. I definitely savored every little bit of it and i also have you saved to fav to see new information on your site. Thank you so much! I really appreciate your comments.